The Navigators history is a mosaic of thousands of wonderful stories of God at work. 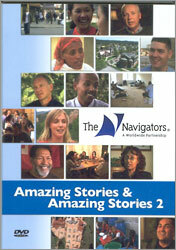 This inspiring compilation of videos (DVD) produced by the U.S. Navigators Communications Department vividly tells some of those stories, giving glimpses of what God is doing all around The Navigators worldwide partnership. Each story illustrates a distinct part of our calling, vision, or values. Many have found these stories to be useful as discussion starters, sermon illustrations, or inspiration for others considering joining hands with us in our calling.